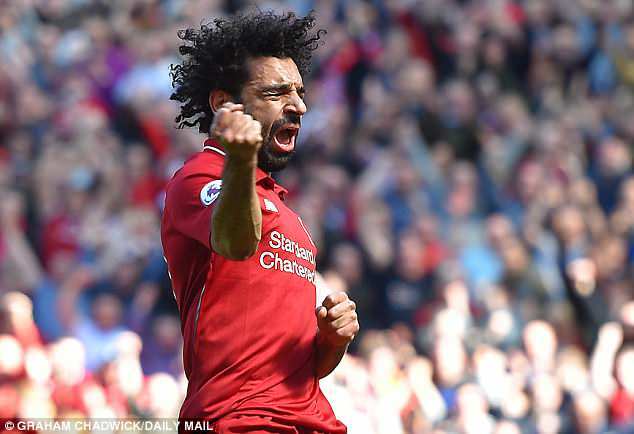 EPL Review: Mo Salah, signing of the season! 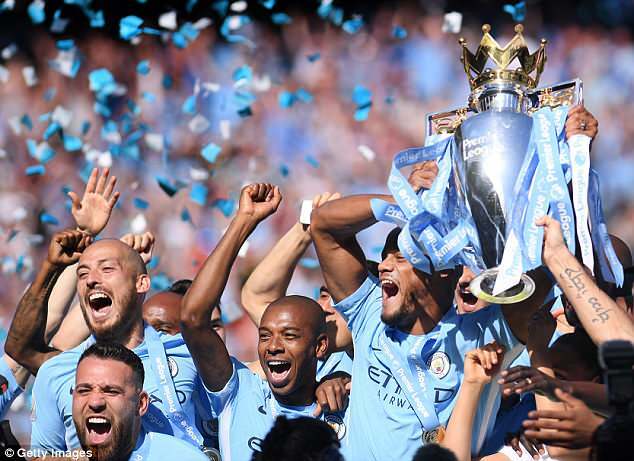 The curtain has finally come down on the Premier League season after a memorable 276 days of action. While Manchester City stole the headlines throughout with their incredible record-breaking run to the title, there were plenty of other moments to savour. The 10 minute spell when Liverpool engaged overdrive against Manchester City in January and went from 1-1 to 4-1 in a flash. That was everything what football should be in this country – two top teams committed to attack, a stadium bouncing with noise and goals to take the breath away. There was Mohamed Salah, Sadio Mane and Roberto Firmino at their absolute best. Wayne Rooney, Everton v West Ham United, November 29: A genuine ‘out of your seat’ strike. From the moment the ball came to him, inside his own half, you could see what he was going to do but the execution, the speed of thought and the quality of the strike were absolutely magnificent. What a way to round off a hat-trick. Mohamed Salah. It would be easy to say Huddersfield or Brighton but I’m going for Salah. Why? Well, when Liverpool signed him, I felt it was too much money for a player who had struggled in England and it felt like Liverpool were taking an expensive gamble on a player who wasn’t necessarily first choice. Those thoughts could not have been more wrong. My Twitter notifications on the afternoon West Brom played Liverpool at The Hawthorns. Having made the schoolboy error of suggesting the game was finished 20 minutes before the end, I was reminded of my naivety in many wonderful, colourful and charming ways. I’d reprint some of them now but all you would see was lots of asterisks and clown emojis! A proper title race. I have the utmost admiration for Manchester City and it is beyond doubt that they are one of the greatest sides we have ever seen. But we have known they were going to be champions since they beat Chelsea at Stamford Bridge in October. We don’t want to see the Premier League be dominated in the same way Juventus and Bayern Munich have a stranglehold on Italy and Germany. Arsene Wenger’s farewell after nearly 22 years in charge at Arsenal. A whirl of emotions and a five-goal win against Burnley as the Emirates twisted Wenger Out into Merci Arsene with some style and he took it all in his elegant stride. Jamie Vardy at West Brom. Few combine pace, energy and technical quality quite like Vardy and this goal was the perfect illustration, at full tilt with the pass dropping over his shoulder and sweetly struck on the volley. Roy Hodgson is devoted to football and was hurt by his England experience but proved he has plenty to offer with a remarkable rescue mission at Crystal Palace. 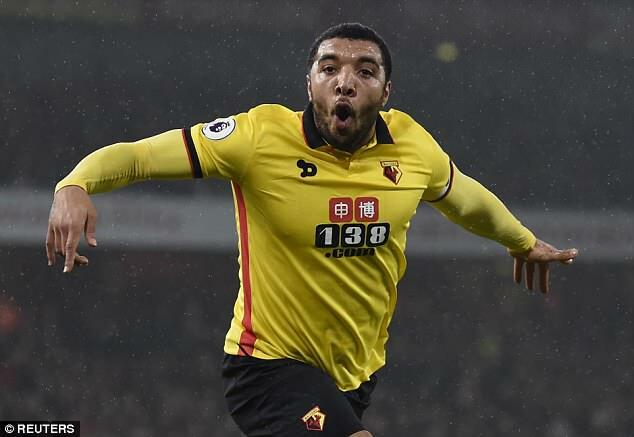 Troy Deeney’s one man war with Arsenal. His perfectly valid ‘cojones’ tirade after Watford’s fight back win at Vicarage Road and his penalty miss when they met again. Great theatre from all concerned. More players like Deeney, please. Start listening to match-going fans on issues such as ticket prices, kick-off times, safe-standing, programmes, etc and stop eroding our football traditions. This season will always remembered for Arsene Wenger leaving Arsenal. One of those ‘where were you when’ moments. A true giant of English football, the Premier League will never be quite the same without the Frenchman. In a league campaign that has been dominated by Manchester City, the departure of Wenger will invariably the story of the year. Wayne Rooney from the halfway line against West Ham. Complete and utter brilliance from England’s greatest ever goalscorer. Only a handful of players have the ability or audacity to ping one in from 60 yards. For sure, Rooney’s past his best – but this was magical. The re-emergence of Roy Hodgson from the shambles of Euro 2016 to manager of the year contender. Hodgson’s a gentleman, he wouldn’t be so crass as to suggest he’s stuck two fingers up at his doubters. But, in effect, that is exactly what he has done. Crystal Palace were dead and buried when he took over; somehow Hodgson comfortably guided them to survival. Two fingers, indeed. 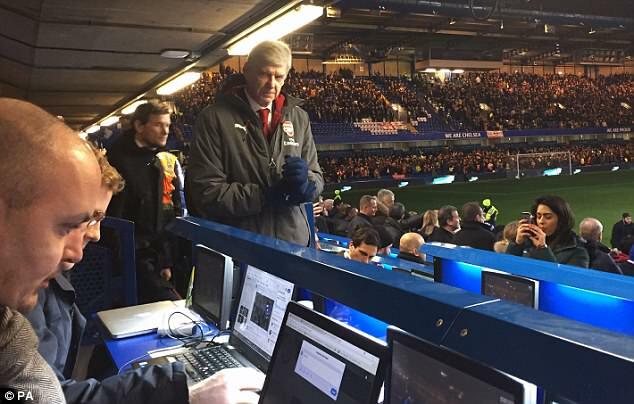 Sitting alongside Wenger in the Stamford Bridge press box during Arsenal’s visit to Chelsea in January. Probably more surreal than laugh out loud, but the picture of the Frenchman perched in the media seats due to a touchline ban certainly brought a smile to the face. A rare insight into the emotions of a Premier League manager on a match day. Can I have two? One: for Sir Alex Ferguson to have made a full recovery. Like Wenger, a true legend of English football. Two: for there to be a genuine title race. City have been spellbinding, magnificent and breathtaking in equal measure. But their brilliance has meant for a unexciting title race. Manchester United, Liverpool, Tottenham, Chelsea, Arsenal, anybody, please stand up. 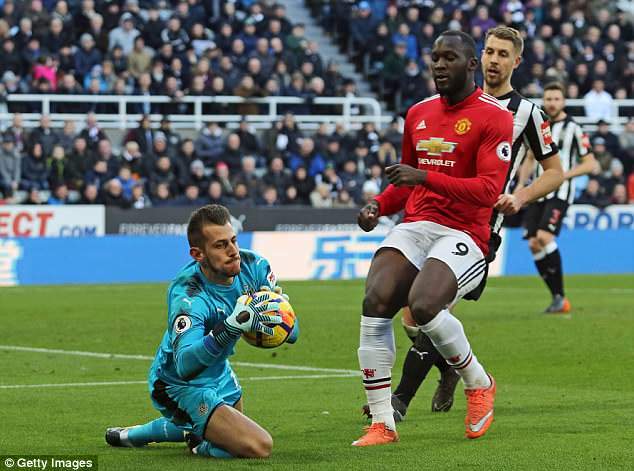 Martin Dubravka’s debut for Newcastle at home to Manchester United was incredible. He’d been plucked from the bench at Sparta Prague but was thrown in against United and was man-of-the-match in a 1-0 victory. As Rafa Benitez told him afterwards, ‘Buy a lottery ticket tonight, because you’ll definitely win’. Wayne Rooney from his own half versus West Ham, a goal you will never tire of watching. The trajectory of the ball proves how perfect his technique needed to be. Mo Salah. Let’s face it, we weren’t expecting him to be anywhere near this good based on his previous spell in the Premier League. He is a joy to watch. Peter Crouch, every time he tweets. Although James Milner is providing some competition since announcing his arrival on social media with a picture of him ironing. A title race which isn’t all but done by February. If Liverpool can rival City then it could be an epic battle. Sadio Mane being sent off at Manchester City, 37 minutes into the game at The Etihad on September 9th. City were 1-0 up at the time but Liverpool were finding all the weak spots they would later exploit in their three victories against City. Mohamed Salah had missed a couple of fine opportunities. And Mane, when sent off — the correct decision — could have been clean through had he been a split second earlier. City’s high line was vulnerable. Let’s be clear: nothing would have stopped City winning the league this season. 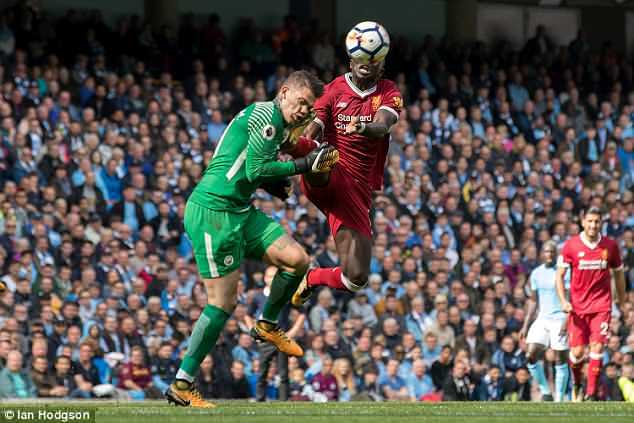 But had Mane nicked the ball past Ederson, had Liverpool won 3-2 – which they later proved themselves more than capable of doing – might the season have unfolded differently? Teams might have concluded City’s defence was still vulnerable and endeavoured to pressurise them more. But with ten men, Liverpool lost 5-0. City’s next six Premier League results were 6-0, 5-0, 1-0 (at Chelsea), 7-2 and 3-0. Many sides gave up on attempting to attack City at that point and settled for damage limitation. That moment framed the season. An end-of-season review that doesn’t laud Mohamed Salah would be worthless. So I’ll go for his last-minute slalom against Tottenham in one of the games of the season, if only for the sheer look of bewilderment on the face of the Spurs defenders. Huddersfield. Not a complete surprise. At the start of the season I did have them do go down – just. But I reckoned the sheer energy David Wagner can create would shock a few teams and they would give it a good go. Their victory over Manchester United, their first for 65 years, was one of the great games of the season. Pep Guardiola calling a ball boy over and then lecturing him with the intensity he would usually reserve for a team talk on the importance of getting the ball back into play as quickly as possible. The lad looked a little overwhelmed. What brought me joy? Watching Manchester City. And Mohamed Salah. Jamie Vardy’s volley against West Bromwich Albion was executed with such sweet timing that witnessing it live provoked applause from even neutrals. It was the way Vardy ran onto Riyad Mahrez’s long pass and shot with his weaker foot without breaking stride. Perhaps not a surprise as such given I did tip Huddersfield to stay up, but the manner of David Wagner’s side securing safety still raised a smile. Those two away displays of fierce determination for the vital points were hugely impressive. And the riotous night out that followed was just brilliant. Manchester City passing up the once-in-a-generation chance to win the title by beating United did make me chuckle. Particularly after being 2-0 up. Revealing club allegiances there, and probably a bad case of bitter schadenfreude, but in a season of major tedium you take what you can. Feel like I’ve said this every season recently, but a proper title race would be most welcome. Give us the days when there were two or three teams battling to the finish, managers cranking up the pressure on each other into May, high drama to the end. Marcus Rashford’s double against Liverpool in March showed just what he can offer on his day and should serve as a reminder of what is to come in the future. Composure and class to down Liverpool and the unbridled joy in the seconds after scoring are both things to remember. Two team goals stand out. Willian’s at Brighton and David Silva’s at Stoke. Manchester City’s just edges it because of the speed in which they broke through Gabriel Jesus, splitting centre half and full back for Raheem Sterling before David Silva caressed his pinpoint cross past Jack Butland by Silva. Simplicity looks so graceful when executed that marvellously. Burnley. Might be an obvious one but their lack of cover at centre half – and going into the season with the largely untried James Tarkowski in the starting XI – was a major worry. I guess you shouldn’t really doubt Sean Dyche! Oleksandr Zinchenko knocking over the Premier League trophy last week. ‘I was so scared – did you see my face on the picture? It can happen,’ Zinchenko said. The way in which City’s players celebrated with supporters on a night out in Hale raised a smile too. That was an eventful evening. That I pluck up the courage to mute the term ‘VAR’ on Twitter. New technology has the potential to completely consume football and how we debate it and that has already become a bit boring with the VAR trials this year. We’re moving further and further away from talking about the individuals and tactical side of what makes the game so absorbing. Gary Neville condemning Paul Pogba at half-time of the Manchester Derby, saying he’d only be fifth choice at City. Within a blink of the restart, Pogba had scored twice and United won 3-2. Who’d be a pundit. I was at Anfield when four Watford defender converged on Mo Salah so tightly I couldn’t see the ball any more. Next thing it popped back into view through a tiny gap and arrowed straight into the corner of the net. It was his fourth of the afternoon. Anyone at Everton surprised at how Sam Allardyce has gone about his business. Anyone at Manchester United surprised about how Jose Mourinho has gone about his business. It’s on the tin. What were you expecting? West Ham supporters joining with Chelsea fans to salute the life of Ray Wilkins. Two big rivals united in respect and admiration at Stamford Bridge. Leroy Sane for Manchester City at Arsenal. So many passes, Arsenal reduced to mannequins in a training session and it summed up all that is brilliant about Pep Guardiola’s team. All three promoted teams shining and deservedly staying up. All three clubs stood by their managers, even at difficult times, when all around them were firing bosses. Sometimes it is worth remembering why you hired somebody in the first place. Too many teams are consumed with fear of relegation and the joy has gone from their play. Crystal Palace under Roy Hodgson did it right; playing with courage and adventure. Nearly every other team outside the top six can be too defensive. The day Arsene Wenger announced he was leaving Arsenal after 22 years will stand out for me. End of an era. We knew it was coming but still a ‘crikey’ moment. Wayne Rooney against West Ham gets my vote. On the half volley from his own half to complete a hat-trick at Goodison Park. A Hammers defender tried to handball it away too but failed. The fact that the three promoted teams put up a fight and survived. They can often get written off before the season even starts. Kudos to them, especially relegation favourites Huddersfield. Not a one-horse race. I’d like to see Liverpool give Manchester City a run for their money. Liverpool showing the rest of the league that the Manchester City juggernaut could be stopped – or at least temporarily slowed down – with that thrill-a-minute 4-3 win at Anfield in January. It was a Premier League classic played at breakneck speed and, having blitzed City with three goals in nine minutes to lead 4-1, Liverpool almost threw it away! First-rate entertainment. 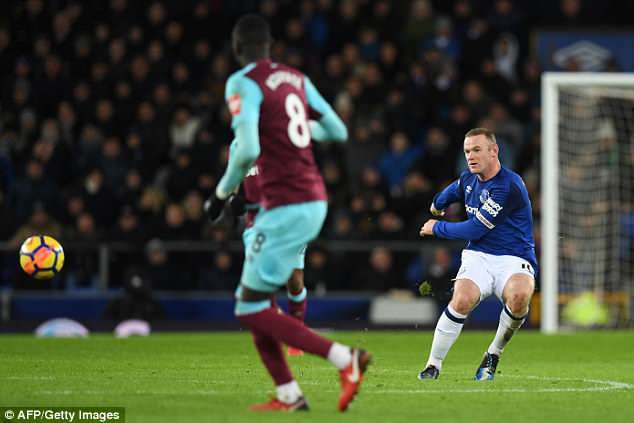 Wayne Rooney’s strike from inside his own half for Everton against West Ham in November showed he’s still got it in what looks likely to be his final Premier League season. As the ball rolled towards him, five yards inside his own half, it’s the fact that Rooney didn’t even have a second thought, hitting it sweetly first-time and with only the minimum of elevation so that it barely cleared Joe Hart and his defenders. The fact all three of the promoted sides have survived having been a real credit to the top-flight. 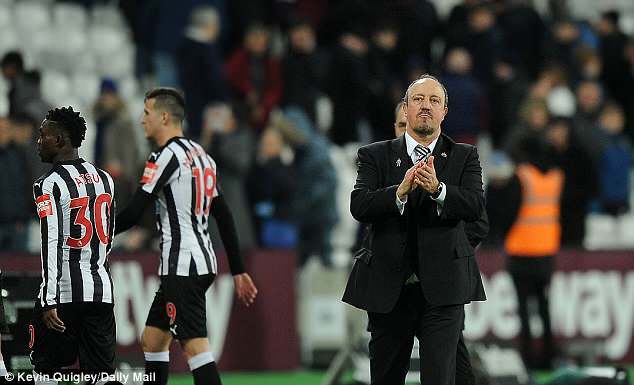 Rafa Benitez continues to work wonders at Newcastle and top half finish would be incredible – even when down in 18th, you always felt they would be fine. Brighton have been a credit to their manager Chris Hughton and, again, never really looked in too much bother. Huddersfield have been sucked into the struggle having been mid-table for quite a lot of the season and to secure their safety against Man City and then Chelsea was excellent. Crystal Palace getting rid of Frank de Boer after just four – admittedly terrible – performances at the very start of the season. The decision was vindicated in the end as Roy Hodgson led them to safety with a bit to spare, but why allow De Boer a full pre-season, with funds to spend, then sack him before mid-September? There was so much lofty talk about implementing a new philosophy at Selhurst Park – then expecting it to be done within a month. A tighter title race and I think we’ll get one. I believe City will be desperate to win the Champions League following the disappointment of going out to Liverpool and it will therefore be a tighter race at home. Man United and Liverpool will definitely be stronger, while Tottenham will hope to benefit from their new stadium and Arsenal and Chelsea will have new managers. Huddersfield’s run-in, finishing with that remarkable draw at Chelsea, tops it for me. That moment of pinball in the area that somehow didn’t result in a last-gasp winner for Chelsea. That Jonas Lossl save. That sheer elation when the final whistle blew, and David Wagner being thrown in the air. Wayne Rooney’s goal from his own half against West Ham. Pure instinct and a moment he will cherish even more if his second spell at his boyhood club ends this summer. Mohamed Salah. He has been consistently brilliant to watch and has scored such a variety of goals. That deft chip against West Brom in April, which took him to 31 Premier League goals and equalled the record for a 38-game season, stands out. 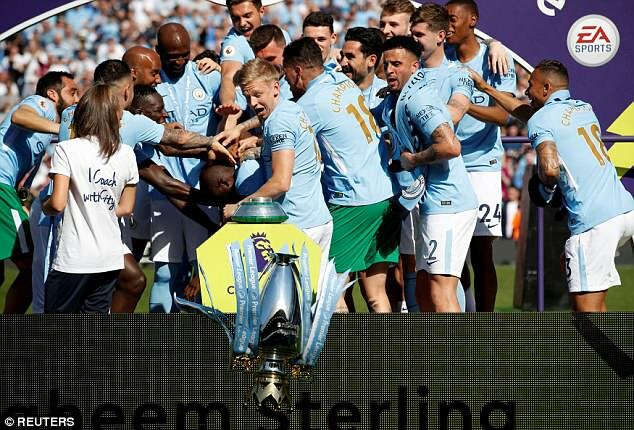 Kyle Walker’s reaction when Oleksandr Zinchenko knocked the Premier League trophy off the pedestal during Manchester City’s title celebrations was priceless. Walker stood pointing, like a schoolboy snitching on his friend, while Zinchenko just frowned at the trophy on the floor. A title race. However impressive the manner of City’s victory has been, it is a slight shame that it has been all wrapped up for quite so long. That being said, the race for the top four has made up for it. It would be nice to see City challenged next year, though it will be no mean feat. Probably Liverpool’s 4-3 win against City at Anfield. The problem with this season is that the league campaign was done and dusted so early on. When City went to face Liverpool there were doubts they would be beaten all season. Philippe Coutinho had also left Merseyside just before the game. It didn’t matter. That game provides hope that we might actually have a challenger to City’s crown next season. 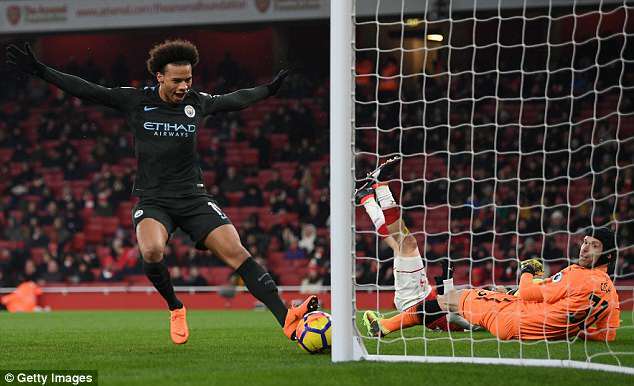 If there were a goal to sum up a Premier League season and a team, it’d be Leroy Sane’s against Arsenal. Every element of it is dripping in quality — except for the finish. The move up the field is ridiculous and showcases Pep Guardiola’s swashbuckling Manchester City side at their best. Burnley. There’s something to be admired about a team that plays an excellent 4-4-2 with a large and large strike partnership. Sean Dyche did brilliantly in improving the issues with his side from the season prior. The signing of Chris Wood was a bit of a masterstroke. Ashley Barnes has been impressive. And now they get to go on a European tour. What a treat for fans of the club. I really did enjoy Pep Guardiola ranting and raving at Nathan Redmond before explaining that it was because he was such a talented player. As someone on Twitter put it, the City manager simply will not rest until he has improved every single slightly flighty winger in this country. That would make him so, so, so happy. This is an oddly specific one, but I’d like to see Newcastle do well under Rafa Benitez. They’re a big club with a manager who has managed to improve his players to a serious degree. There’s a sense that if he is backed correctly he could, at the least, match what Dyche has achieved with Burnley this season. He needs investment in the team this summer to give him a bit more quality to work with.